Any thoughts, or ideas for what you’d like covered in the future — I’d love to hear them! Leave me a comment below. How do you make any story that you tell super-compelling? What do I mean? How do you do that? I’m going to tell you. 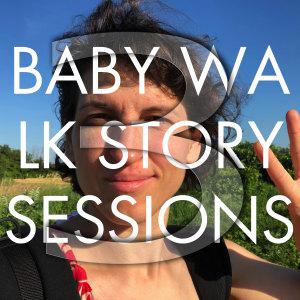 This is the Baby Walk Story Sessions number three! I’m walking with the baby. Were you listening to the recording, you might hear her in the background. We are in the middle of the country. So some cars might go past. You can hear rustling of trees and also it’s slightly raining. So I hope I’m not going to break my phone with this. OK. So in episode number two, if you listened to it or read the transcript, you will have heard me talking about editing and about how when you’re telling a story, you’re making a movie inside someone’s brain and so as much as possible, you want that movie to be made up of not voiceover, not montage, but of action scenes. — and that’s a story about me ringing on my mum’s doorbell when I go home. Anyway, my point is the first one was narratively way more exciting. The second one was like more engaging to listen to because I got you into my body. The way that I did that was I answered two questions. By that, I mean what did it look like but also any sensory details. So like what did it smell like? What did it sound like? What did it physically feel like? What did it taste like, if there’s one of those? As we said when we talked about editing, you can’t describe absolutely every single tiny thing because otherwise, you would just be there for ages and you don’t need most of those. So it’s really like what details do you need to hear in order to feel the way that I felt in that moment. Like what details have to be there? So I didn’t tell you the colour of my mom’s front door because you don’t really need to and maybe I could have if I had been like it’s like a big old, I don’t know, creaky wooden – I can’t remember what mom’s front door is. That’s a pretty good sign that it shouldn’t be in that scene. But I told you about the sound of the dring-dring of ringing the bell three times because that to me is such like oh, I’m home. That’s such a familiar sound to me. So what did it look like, sound like, feel like? That question. Again, what needs to be there in order to give me like a good sense of place? Give me, the reader or the listener, a good sense of where you were. So if I just said I stood there feeling excited – I told you everything, how I felt. But I didn’t tell you about ringing on the doorbell. You might be like, “Are you on a plane? Are you like in a car? Are you asleep? What’s happening?” So just give me enough a sense of place. Emotions are the most important thing in a story. Leaving these out is the biggest mistake that people make. Because emotions are how we connect to the story. Emotions are how we can relate to the story. I have not had every experience but I have had most emotions. 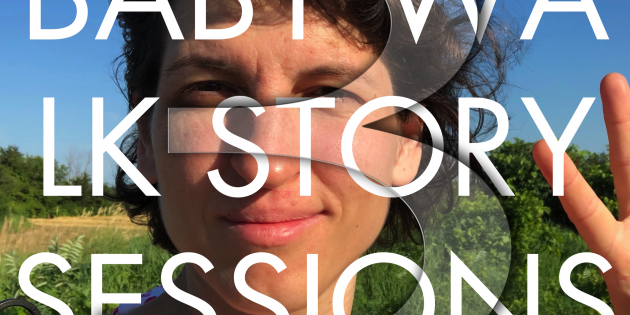 So for example, somebody at my live show True Stories Toronto, which happens in West Toronto told the story a while back about protesting at Standing Rock in North Dakota and it was this incredible, really powerful story. All of us were like kind of jazzed afterwards because we were so like moved by this story. Now, I have never been to protests at Standing Rock in North Dakota. I imagine like most people in the room hadn’t either. I imagine most people in the room like me had never been to the kind of protest where you might get maced or arrested just for showing up. So I can’t relate to that. But what I can relate to is knowing how it feels to be somewhere where you’re supposed to be brave and to feel terrified. So when Dan talked about that, I could relate. I know how it feels to be somewhere you’re supposed to feel brave, supposed to be brave, to do the cowardly thing and then to feel shame. So I could connect to that. THAT’s what made his story so powerful. The most important thing to have in your stories is to answer the question, “How did you feel?” and even if you’re not super good at that because you are British or Colonial North American – my people brought that to your people. You’re welcome. This is absolutely a skill that you can practice and there are three different ways that you can express how you feel and I’ve put all those into a PDF and a video which honestly we worked so hard on. There are a lot of costume changes. At one point, there’s me dressed as a therapist giving another version of me therapy very briefly. Thank you so much for reading! If you have any comments, I would love to hear them below. If you want to share it as well, you can do that using one of the round buttons below. All right. Thanks so much. See you on the next episode. I say, “see you.” This is the transcript of audio. So more like you will hear me on the next episode, or perhaps read me. But I feel like we get to hang out because I’m kind of talking intimately into my hand right now and the baby can’t hear me. I mean she can hear me but she doesn’t understand me because she doesn’t have language yet. Anyway, this just got weird. All right. I will see you next time. Bye! Thoughts? Feedback if you’d tried it out? Let me know in the comments below!